A conversation with Shannon and ‘Wild Nights with Emily’ director Madeleine Olnek. While she is one of the few female poets in the classic literary canon, Emily Dickinson is still misunderstood. The enduring image of Dickinson is of a dour 19th century spinster locked away in her home speaking to people through walls, a genius who refused to publish her work and wanted it all destroyed after her death. In reality, Dickinson was a vibrant woman who was tenacious about getting her poems published, who was turned down again and again by men who refused to see her brilliance. Dickinson was also a queer woman who spent her life devoted to her brother’s wife, Susan, a love supported by hundreds of poems and love letters, now brought to life in Wild Nights with Emily. The film is a comedic and dramatic take on the poet’s life and loves, starring Saturday Night Live icon Molly Shannon as Dickinson. The film, out Friday, was directed by Shannon’s longtime friend Madeleine Olnek, who knew casting the comedy legend as Dickinson would help make her story more accessible. I'm a queer woman, a journalist, what Fox News might call a liberal media elite. And yet, I had no idea Emily Dickinson was queer. Is this something you're experiencing a lot, that the average person is very shook by this revelation of what her life actually was? Molly Shannon: Yes. That is what we experience. I think there was a lot of collusion between people close to Emily Dickinson who had seen these letters that have been around for years and years, and years, and years, and years. But they were worried that if the truth of Emily Dickinson's life got out, that she had a long 40-year romantic and also creative relationship with Susan, her brother's wife, then the reading public who was so enamored of the image of the shy spinster recluse would maybe no longer want to read her poetry. So Madeleine and I look at it as like hiding in plain sight. Because really, scholars, historians, and researchers have had access to these letters and poems for forever. Madeleine Olnek: Yeah, yeah. And there was a book of Emily's letters to Susan published in 1998. And there was another book that came out in 1951 that was about Emily's affair with another woman, Kate. There is a kind of a willful disregarding of who she was. And you're right. Shannon: And also, I was going to add to that, that this book that came out in 1951 about her affair with Kate — that story's also in the movie, as you saw. But 1951 was the height of the red scare, where homosexuality was equated with Communism. So this could have threatened Emily Dickinson's poems being read in schools. Why is the use of humor so important in telling Emily's story? Shannon: I think it makes it more accessible as opposed to like a dusty, how we think of her like Emily Dickinson, talking to people through walls, peering out the window, opening the curtain to look down at the funeral. Olnek: One of the big surprises for me with this story...First, finding out about her queerness and then finding out basically every single thing we'd been told about Emily Dickinson, the reverse was true. And one of those big things was that Emily Dickinson had a wonderful sense of humor. She was not a miserable wretch, who was furious and dramatic and morbid and...she was a wonderful person, full of life and very funny, too. There's this enduring narrative that Emily was a recluse, who wanted her work burned after her death but, as this film shows, she was actually very proactive about trying to get her poems published. What does that misconception says about the way that women's stories have been controlled throughout history? Shannon: It's so interesting because, right, she's presented as a victim, frightened woman, speaking through walls, no desire to get her voice heard but it's this notion of her sabotages women today who struggle to get their voices heard. These women who are looking for role models and the truth is that Emily was so hungry to get published, she sent over 90 poems to Higginson, the editor of the Atlantic Monthly. She sent poems to Samuel Bowles from the Springfield Republican, she made DIY poetry books where she copied over 800 poems into booklets...she sent poems to the Robbers brothers but they rejected her work. She sent in huge amounts of work, and they said, "Yeah, not, not good enough." Olnek: Part of the investment, too, in having that image of her was to make her appealing. The idea that she wrote without wanting people to read her work and hid it away, was a way that they could celebrate her as a woman writer; we can only enjoy the work if she wasn't a crass, publicity-seeking whore. She was a dainty lady who did not want to make an utterance in public. It had to do both with a way to sell her but it was also a way that women are perceived. We want to show her as this tremendously gifted writer who experienced rejection so that she can serve as an empowering role model for modern female writers, currently with very similar struggles. Madeleine, how did you know that Molly was right for this role? Olnek: One of the things that was amazing about Emily Dickinson's life was the idea that when Thomas Wentworth Higginson, who is one of the editors of the Atlantic Monthly, came and visited Emily Dickinson in her home, she talked and talked and talked, she didn't let him get a word in edgewise; this was the famous meeting. And, I remember thinking, "Oh, my God! Emily Dickinson was auditioning for Higginson! She didn't want to be published, why would she have tried so hard to please him and to sell her brains, display her brains for him?" And, when we were undergrads and we did the comedy show where Molly first wrote and created her character — which became Mary Katherine Gallagher — I had put the construct on the scene that it was an audition scene ... that was my contribution. Because I think auditions are so funny, that one person comes in and pours their heart out and then the director's sitting there, "Leave your name with the girl, thank you!" But, I was like, "Oh, my God! Emily Dickinson was auditioning, this has to be Molly." I just saw her and thought people will finally understand Emily Dickinson's desires to be heard as a writer if it's Molly playing that scene. Because it was so heartfelt and it was so active! It was so much the opposite of what people think of when they think of Emily Dickinson and they think of the shy, retiring woman who didn't want to speak up for herself and had a nervous condition. So, that was in terms of us truly understanding Emily and when we lose these histories of women, we do, it has a hand in the creation of this misogynist world that causes us all to suffer. I think with Donald Trump as our president, we're finally reckoning as this society like, "You know what? We're all paying for misogyny right now". 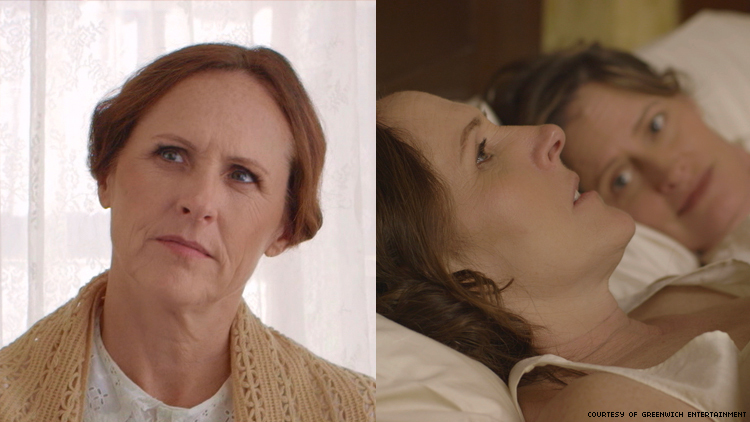 So, restoring who she was is so important and I felt like if Molly Shannon played Emily Dickinson, people would finally understand who Emily Dickinson really was. Molly, what was it like to play someone who is a little more deadpan than the characters you're known for but who has so much depth? And, also, to go from being a gay icon to playing a gay-comma-icon? Shannon: I didn't mind that she's more deadpan. Madeline really helped me, so I did not mind that. Madeline is just really good at directing me. The scene with Higginson's one of my favorites, 'cuz I like that she's really not deadpan at all! She's like, "Well, this is a really big meeting for us!" And she's really selling herself and talking a mile a minute and she presents very good points and he ends up criticizing her work, so, I don't know. It was great playing a gay icon like Emily Dickinson and that's very sweet what you say. Olnek: I think it's great, too because Molly will bring a whole new audience to Dickinson's work. I mean as a gay icon, playing a gay-comma-icon, lots of men who might not have been interested in Emily Dickinson will be suddenly interested. We had a large bro attendance at SXSW when we premiered. Lots of dudes there that were like, "Man, I never thought I'd see an Emily Dickinson movie but Molly Shannon's in it!" So, it is wonderful because it's bringing her iconness full-circle, I think. I know we have to wrap up but thank you and...I really, really enjoyed this movie, I actually cried through the last 10 minutes of it. Molly: What made you cry? When Susan was washing Emily's body after she dies, I was weeping. And, then, at the end, it was so sad to realize that this woman is so misremembered. Shannon: Yeah, I mean it makes me cry, too. Olnek: And we are still getting pushback from the press, which is really ... some stuff where it's, "The debate [about Dickinson’s sexuality] has not been settled." And it's like, why is there even an debate? Go and read her letters and it's so clear. So, there is a lot of resistance and any help you can give us, getting out the word, we're very appreciative.